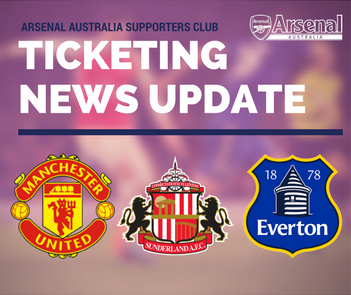 We are getting close to the business end of the season with ticket applications here at Arsenal Australia supporters club as we start applications for games in late April and May. Application window dates are listed below and please note that with the home match v Manchester United tickets will be heavily requested so some members will miss out for ticked to this match. If we also proceed through either the FA cup or UCL and draw another home match please keep a daily watch on the website for matches to open as they will open quickly once draws have been done.